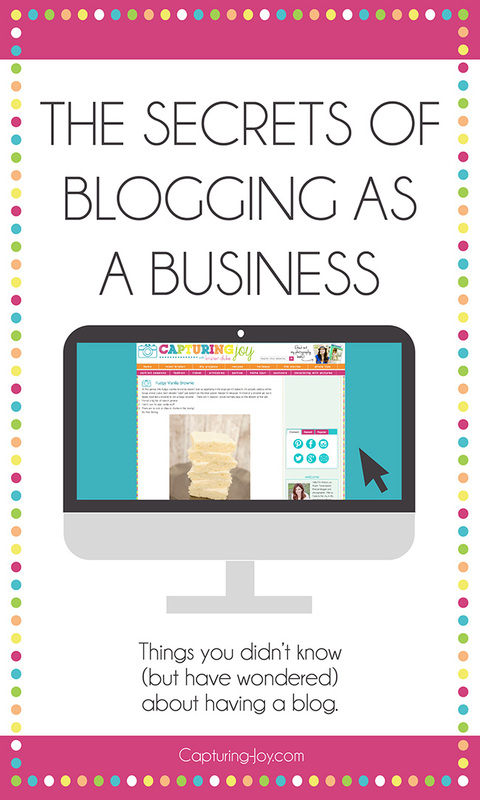 I’ve got some secrets to share, if you missed the first post, you might want to read The Secrets of Blogging as a Business Part I before jumping into this, The Secrets of Blogging as a Business Part II. This is a 3 part series (all posted today). There is just so much to say, I can’t possibly say it all in one post. Pretty much, in blogging, your worth (or success) is calculated by how many pageviews you have per month.The way you get paid with ads is dependent on how many PAGEVIEWS you have on your site. It’s all about the clicks. It’s s secret thing that, like money, most people don’t know or discuss with each other. Amidst the blogging circles, it’s discussed in hushed tones. It can be sticky to discuss, but doesn’t have to be. I feel that after finding people that you know well, it’s important to discuss these things and not take it personally to realize your bestie gets more pageviews than you. I recently was asked to be a part of a blogging network group of 7 or so of us, and we talk all about numbers openly. It’s very refreshing, because it helps me to gauge if I’m on the right track with what I am doing. If you are curious about the number of pageviews a blog has, some will post their monthly pageviews on an Advertise or Sponsor tab on their sites, as a way for brands and companies to see at a glance what their numbers are. Unlike social media, no one can see your pageviews unless you tell them, or do a screen shot of your stats (Google Analytics must be installed on your site for this). If I’m curious how many pageviews a blogger gets, I’ll often check those tabs, but some don’t post it, they say, “email me for stats.” I just like to put it all out there, so I do have that info on my site. Here is a quick glance of the ups and downs of my pageviews in the last 6 months. I was steady and lower from July-August, then in September, it started climbing, then BAM! Highest pageviews in one day, 52,197 on October 2nd. The scale is from July 1-Dec 31. There are MANY ways to make money on a blog. Here are the 5 main revenue streams that I use on my website. Ads: The first thing you should do when you decide to blog for a business is to get ads up on your site. At first it feels weird to have them, but you’ve got to get over it. They aren’t pretty, but they are a necessary passive income. I say passive because you stick them up there, and generally don’t have to mess with them. There are many ad companies, the easiest platform that people tend to gravitate towards is Google Adsense. You sign up, get some coding to put on your site, tell them how you want to be paid, and don’t mess with it. This is all for the beginner, once you are blogging for a bit, and maybe go to a conference or read about more in depth ways to make money with ads, you’ll find there is a strategy to make the most of them, but all that stuff hurts my head. 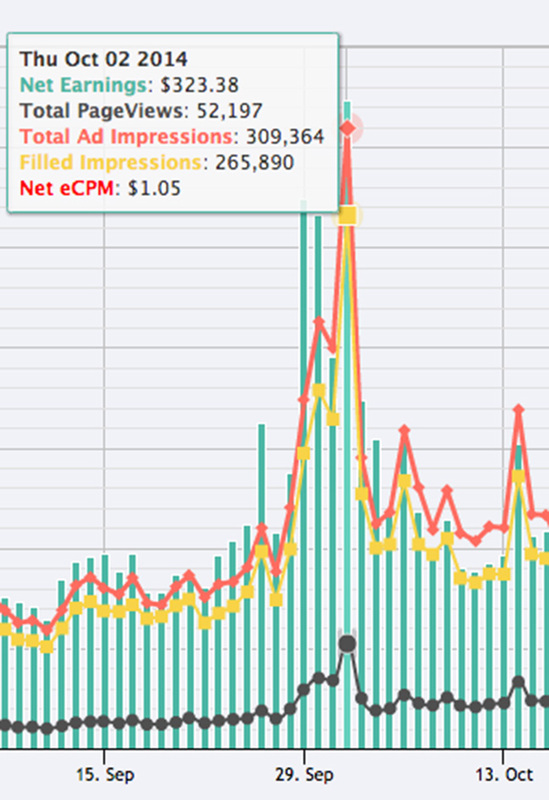 The way you get paid with ads is by how many PAGEVIEWS you have on your site, or clicks. Someone recently asked me if I get paid if I don’t blog for a week, and the answer is yes. I don’t have to have current content to make money from ads, because people are constantly clicking over from google and pinterest, and landing on old posts. Sponsored posts: This is when you write a post, specifically for a brand or company. I’ve worked directly with brands that I have met at conferences, and other brands that have been to my site, and email me directly and ask to sponsor a post. I’ve also worked with ad/PR companies or “middle men” as I like to call them, because they work for companies, and reach out to bloggers on their behalf, or have a platform that you sign up for, and they email out opportunities, that bloggers can apply for. I used to love sponsored posts, and got all excited for someone to pay me $100 just to write about a free product they sent me! Now, I’m very selective, and will charge $500-700 for a post, depending on the product. I very rarely blog something I was sent for free (without pay). Sometimes I’ve done posts that I’ve regretted because it was forced, and I’ve had to really think about opportunities that comes my way, and how much I really want to dedicate 4 hours+ of my time to, and how it will look to my audience. I regret this post. They offered me $400, and I said I’d do it for $600, thinking they’d say, “no thanks” and they accepted me! So I wrote it with a free print for the bathroom, but it still felt weird to write about Listerine, even if we use it. I also had to re-take the pictures a few different times, and go back in and edit the post after it was live, so it was all a big pain in the end! THIS POST for Glamour was a fun one to put together! Affiliates: Affiliates are when you “name drop” a company, and link up to their site via their affiliate, and you get a cut of the profit made that came from your site. They use certain tracking codes, that can detect all sorts of things. My favorite Affiliate is Amazon, because it is the easiest to use, and everyone shops on Amazon. So when I talk about my camera, and share photo tips, if someone wants to see which camera I have, they’d click on that link, see my camera, and even if they don’t buy that item, if they buy ANYTHING from Amazon within 24 hours (I think is the timeframe) then I make a small percentage. There are rules and guidelines to that, to make sure we follow protocol, and in that post, I am supposed to say, “Some links contain affiliates.” As a seller or product, I COULD have my Say NO to Auto book be an affiliate to other bloggers, and I started to, but it’s too much effort for me to go in and pay bloggers who are an affiliate, so I don’t do it. Lots of bloggers with books do that though. Besides Amazon, I also like BLURB, FOTOstrap, JANE, Stitch Fix, and Blue Host, two products that I stand by and love. E-book: If you have a topic that you are PASSIONATE about, and have a lot to say, consider an e-book! 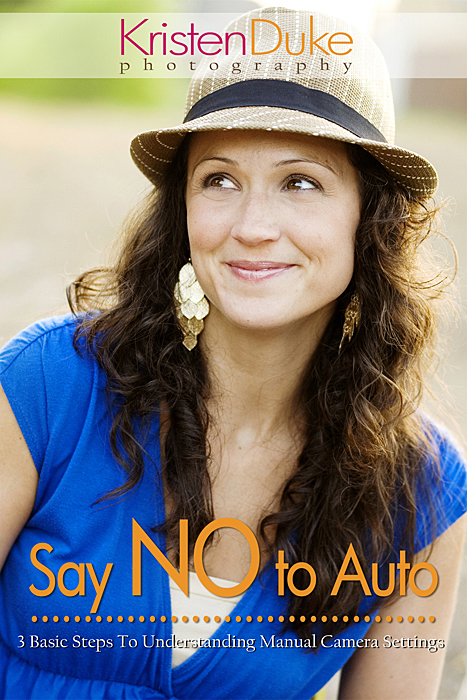 My E-book, Say NO to Auto, kinda happened by accident, 4 years ago. It took a while to create, then the second book, but it’s been amazing income all this time. It’s passive, just sits on my sidebar (and footer of posts), so if anyone comes to my site for recipes, travel posts, or birthday parties, they can see my book info, and if they are interested in learning about photography, then can click to learn more. I think $10 is a pretty standard price for e-books, some $4.99. You decide, based on content. I’ll have half off sales from time to time, as well. The more traffic I get to my site, the more people see it, the more people buy it. I sell about 100 e-books each month, and 20-25 printed copies (that I mark up higher, and ship out). I use e-junkie to host the books, pay them $5 a month (for 1 e-book) and they do EVERYTHING! Funny enough, for the entire first year of my e-book, I didn’t know about e-junkie, and I was manually emailing a link within 24 hours to each person that bought the e-book. Talk about crazy! Write for other websites: This isn’t necessarily something that you apply for, but there are lots of companies out there seeking bloggers to submit content to their sites, but they generally come to you, and you have to weigh out if you want to dedicate time, depending on what they pay. I wrote an article a month for the New York Institute of Photography for a year, then I’ve written for E-how each week for a while, and I’ve written randomly for Black River Imaging (click on those links to see my articles). These posts often aren’t the best pay, but they are great opportunities to work with brands, gain new audiences from their readers and social media following when they promote you, and it feels pretty cool to be asked! Pinterest: This is the #1 referral site for most bloggers. It used to be better, then Pinterest changed their algorithms, but it’s still pretty amazing. Bloggers had to learn some tricks (such as using very descriptive picture titles), and change the way we do things, but it’s worked out well. I don’t know about you, but when I go to search for a recipe or DIY tutorial, I go to Pinterest before I go to a google search. You’ll see that titles and collage images have the greatest “visual real estate” and are seen more, along with very descriptive info at the bottom of each pin. Yes, we pin our own stuff. Hopefully cycling through our top content throughout one month, then again the next month because it will have been old news, and we need to make it new new again. Cross promotion with other bloggers is KEY on Pinterest, so our posts get out there as much as possible. Facebook: Oh Facebook, the one we love to hate. I’ve got 35k Facebook followers, but for most of my posts that I share on there, only about 2-3k actually see it. The trick with Facebook is that the more likes, comments, and SHARES you get on each post, then Facebook see’s it as “beneficial” and will show it to more of your followers then. It’s a game that you have to figure out how to play. It’s frustrating, but it is what it is. So as bloggers, we try to engage (ask questions), share our own content, and the content of our friends and other great stuff that we think our readers will like. So we share throughout the day (thanks to a scheduler, we can plan ahead), with hopes that if 3k see one post, then maybe another 3k will see another post, and another 3k will see another post, and will click to our FB page, then crossing fingers, some back to our site for those beloved Pageviews. But I do LOVE engaging with people on facebook, it’s fun to ask random questions and hear responses, and I LOVE to ask kid or travel questions, because there are so many opinions out there from so many different places! Google +: This one, lots of us dragged our feet, kicking and screaming, not wanting to add another social media outlet to our promotion schedule. It seemed like a Facebook that no one was using. Then we realized that it’s all connected to the Google search, and we reluctantly jumped on board. If you follow me on Google +, and search for something on Google, then my content will show up close to the top. If you don’t follow me on Google +, some might show up high on a google search, or low, hard to tell (depending on the popularity of the post). The more “+1’s” and comments and shares, the better your content in a google search. I’m in a group with a handful of friends, and we make sure we do that on each others content, to give it a little BOOST. Instagram: This is the most fun, simple sharing. However, I see it as the one that sends the least traffic to my site. I had to make a decision a few months ago, if I wanted it to be for business, or “friends in real life” and I ultimately have been turning it over to be more business oriented. I really didn’t want to toggle between two accounts, but I ultimately decided to share some pictures of my family here and there, but not the every day stuff that I’m going through. Only pretty pictures. I actually did decide to start a personal, private, no one is following me account, just so I could dump a bunch of pictures and make easy albums for my family! I log into that about every other week and dump 100 pictures at a time–so no one really wants to follow that, except my mom, and she’s not even on Instagram yet! I haven’t tried too hard to grow my readership here, but there are companies who are paying just for Instagram shares, so there is a way to make money on social media that way. (They will actually do this for all social media, depending on your following size). I have friends that have triple the Instagram followers, but I’ve got triple their pageviews, so just because someone has a large following on one outlet, doesn’t mean they have the pageviews that make money. Stumble Upon: I use this just a little bit, I’m in a “stumble” share group. I’ve heard it’s great if your content gets picked up and stumbled a bunch. YouTube: This is GREAT if you want to make videos. You post them on your site, and get paid by views as well. They pay through Google Adsense, so you have to be “on” with them, to make money there. I’ve done some videos, but it’s just that extra effort that I don’t get around to. Then there is learning to video edit….you’ve just gotta pick and choose what you love most. Twitter: It’s important to have a presense on Twitter, brands still use this, and care about numbers, but I don’t love it, never have. Just start following a bunch of people in your niche, and they will likely follow back. If I share a post that I used a certain brand, I’ll tag them on twitter to let them know, and I might get a retweet. Which may or may not result in anything, but it gets the attention of brands, and if they are looking for someone for sponsored posts, you are now on their radar. Email Newsletter: This isn’t technically social media, but it’s a way to get your content “out there.” I have a daily subscription, and a weekly newsletter that goes out to email inboxes. It’s free on MailChimp to collect emails, until you hit 2000, then you have to start paying for their newsletter service. 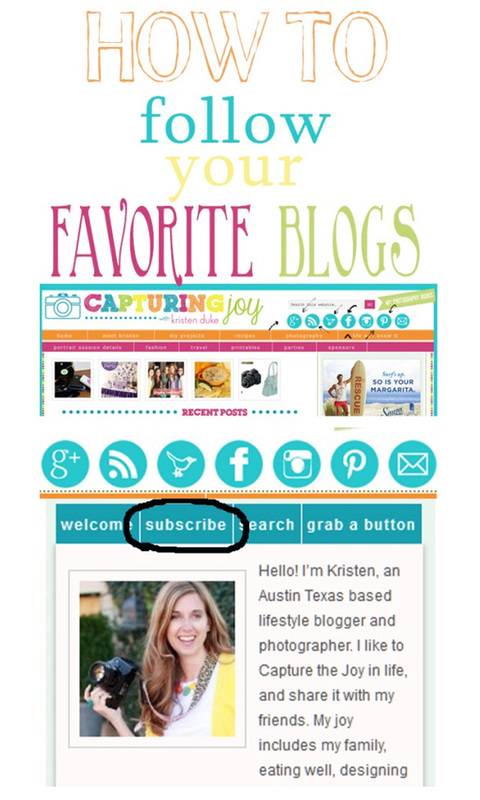 I love those that email subscribe, because unlike Facebook and Pinterest, if you sign up for emails, you will see them. They just might not always get opened! Feature Sites: I’m going to call this social media, because it is a form of promotion that gets traffic back to your site. Submitting your content to get featured at sits such as: Food Gawker, Craft Gawker, and Dwelling Gawker can be great exposure. Sadly, fewer and fewer people are subscribing to blog feeds, and just following through their favorite social media, so it’s important to be on all channels to grab people who are on Facebook and not instagram, get the attention of those on who Stumble, and don’t tweet. As a blogger, it seems easy enough to me to follow my fellow bloggers on their social media, but as a non blogger pointed out to me a while ago, it isn’t as intuitive, so I wrote a post: How to Follow your favorite blogs. ~~~~~~~~~~~~~~~This is the end of Part II. Please leave questions below, in case I didn’t explain something well enough! Also feel free to elaborate on any of the topics above (bloggers) to help others out that may be reading this in the future!